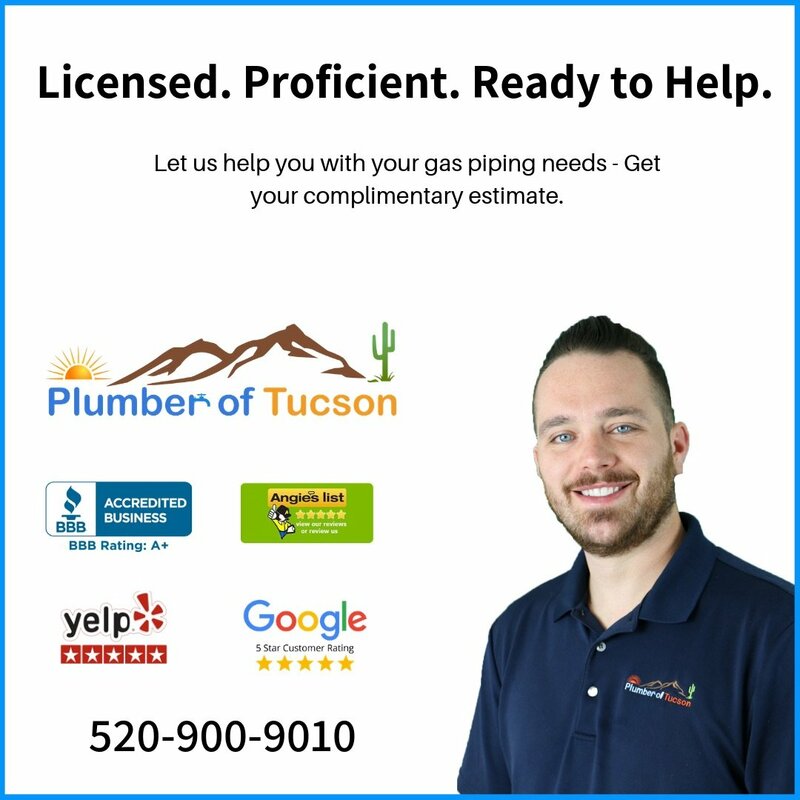 Plumber of Tucson is your local, licensed Gas Plumber in Tucson. We can provide you with gas line leak detection, gas repiping, gas line repairs, and new gas installations for your stove, barbeque, or fireplace. Has Southwest Gas turned off your system due to a leak? We can help you get your gas turned back on right away. Before Southwest Gas turns the gas service back on they will need to see a permit and repair from a licensed plumber. We can acquire the permit, repair it, and be on-call for the inspection to get your gas turned back on as soon as possible. Call us today to discuss your gas piping needs and set up a complimentary estimate. Does your property need a gas repipe? There are various gas pipe materials on the market which allow more longevity than traditional black iron gas pipe. High-Density polyethylene and corrugated stainless steel tubing are two of the more common types of gas piping materials widely used in construction today. These materials cut down installation time and reduce the total amount of fittings needed on projects. This will bring down job costs and save you money. Our Gas Plumbers are qualified and proficient in the latest repiping technologies and methods, so we can quickly resolve your gas repiping needs. Our gas line installations adhere to the National Fuel Gas Codes and local building requirements. Each gas line we install comes with a 25-year warranty on parts and labor. 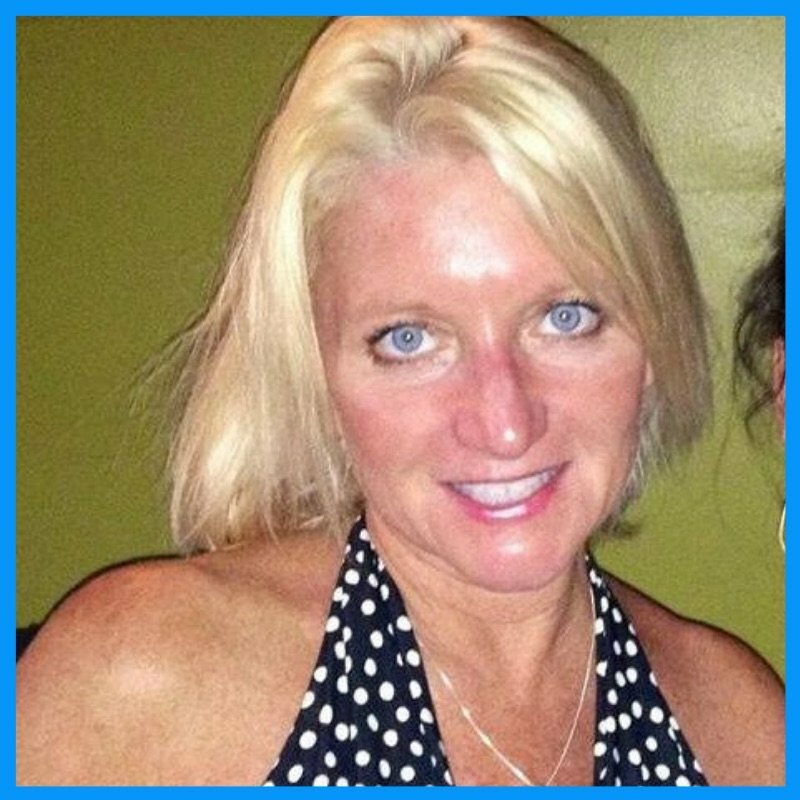 Contact us today- we are ready to serve and we’ll always work with your best interests at heart. 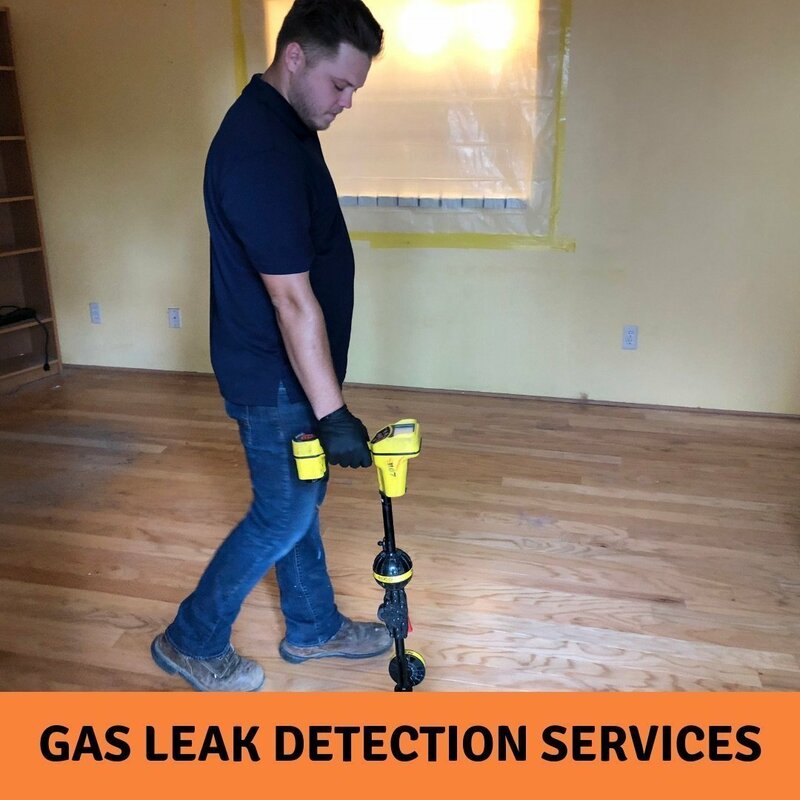 Need an estimate for Gas Leak Detection Tucson? If you have a gas leak and need immediate service, contact us 520-900-9010. We will do all we can to get to you immediately and ensure a safe, efficient, and quick repair. Here at the Plumber of Tucson, we carry various advanced equipment to help us detect the smallest leaks. We will find it, fix it, and keep your home safe during repairs. You can count on us when you have a gas leak, and we are sure to save you money in the process. 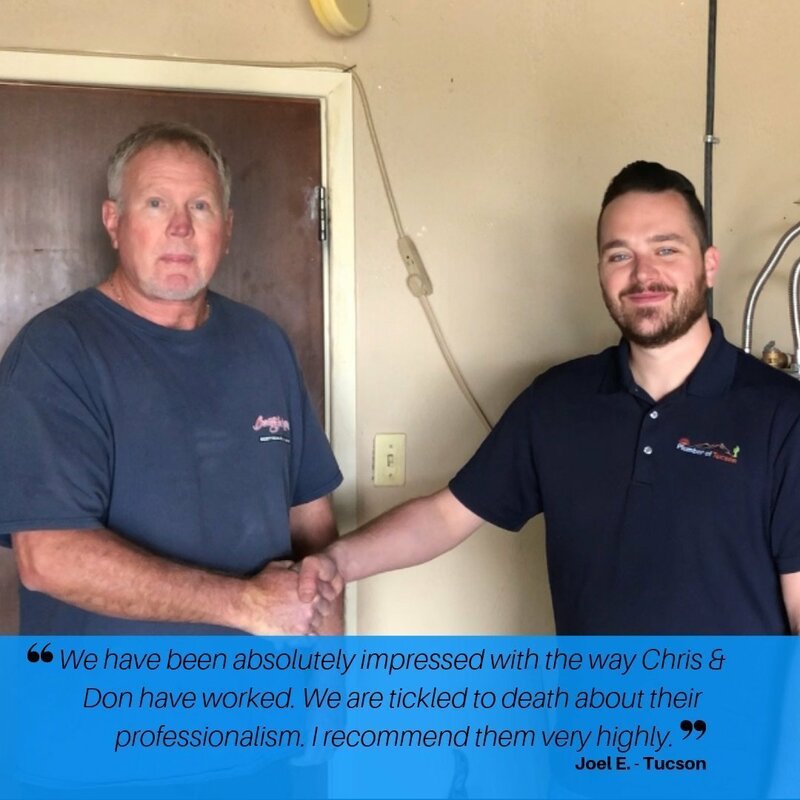 People in Tucson love to choose us because we are licensed, we always work in ways that save you money, we follow building codes, and we do everything we can to safeguard your home while we are onsite. Need a gas line installed to your new stove or BBQ? 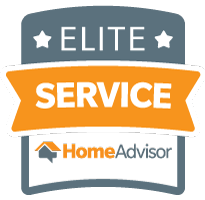 Contact us today for a complimentary estimate. Our non invasive approach to gas line installations will save you money. We remain at the forefront of new technologies that are available for new gas line installations. We install black iron, polyethylene, and corrugated steel gas piping. Our gas line installation process will greatly reduce labor costs all while bringing you long lasting materials. Southwest Gas turned my gas meter off due to a leak. Do I need a permit to get the gas turned back on? Yes. Southwest Gas will only turn the gas back on to the property after the building department provides them with a passed inspection. This means you’ll need- a permit for the repair or repipe, a licensed plumber to complete the project, and a passed inspection from your local building department. 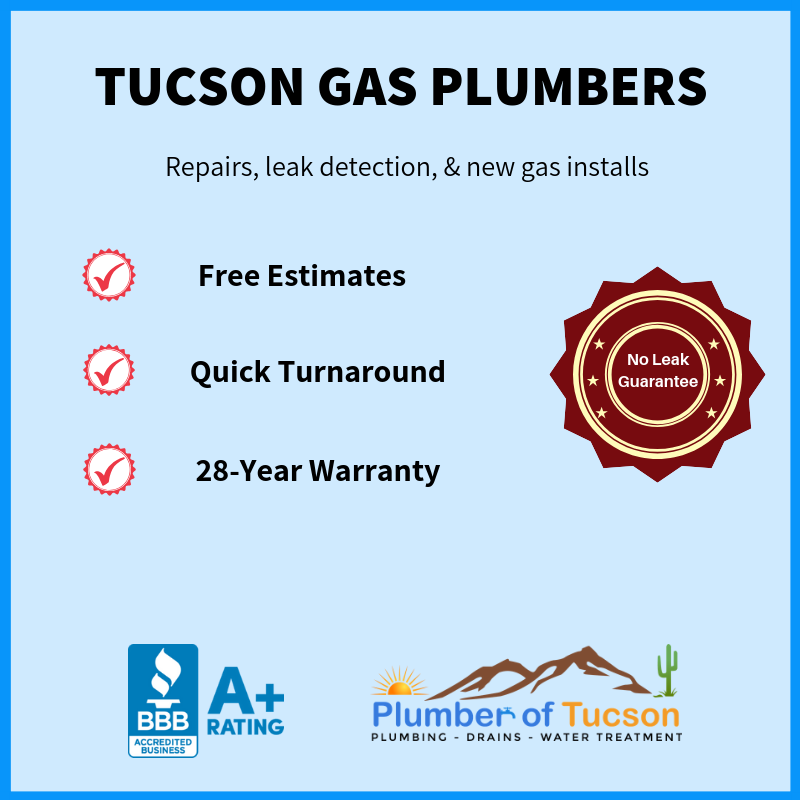 Here at Plumber of Tucson, we are licensed and recognized by the local building departments as qualified gas pipe experts. We can obtain your permit, make the necessary repairs, and get your inspection passed and completed to get your gas back on as soon as possible. How long does it take before I get my gas turned back on? The inspector will come onsite for an inspection the following day after project completion. The inspector will then contact Southwest Gas to inform them they can turn the gas back on. Southwest Gas usually comes out right away. If my existing gas pipes are located under the slab, how will you access them? When your gas lines are located under the slab of the property, we look for ways to “reroute” the gas pipe. We can reroute your gas pipes different ways- through your attic, walls, and ceiling. Or, around the home by digging a new trench. We can also reroute your gas pipes vertically up the side of your home and onto your roof, then back down into the home to each gas burning appliance. How do you find gas leaks? Gas leak detection is done through a combination of techniques. We use gas detecting instruments, air test gauges, and conduct a manual inspection of exposed fittings. Additionally, if the suspected leaking gas line is concealed or under the slab, we modify some of the piping to segregate sections which helps us locate where the gas leak is sourcing. Bottom line… if you have a leak, we can find it. What materials do you use for a gas repipe? We are licensed and qualified to work with all gas pipe materials. However, we only install building code approved gas piping materials. When the pipes are exposed, we use black iron gas pipe. When the pipes are located in the walls, ceiling, and attic, we often use corrugated stainless steel gas pipe. When the pipes are being installed underground, we often use high density polyethylene gas pipe. Our choices for gas pipe materials is based on job efficiency, access, invasiveness, expediency, and financial sensibility. 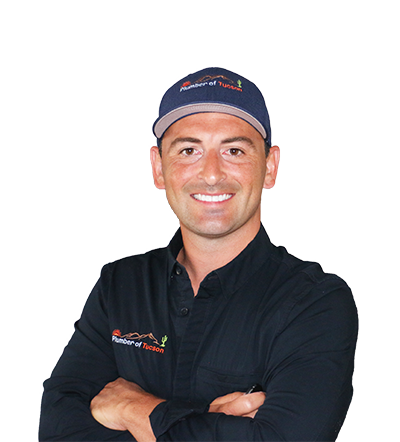 Our goal is to get your gas turned back on with you spending the least amount of money possible, while ensuring longevity in your gas pipe system. What is your warranty for gas repiping and gas line repairs? Our gas line repairs come with a 10-year parts and labor guarantee. Gas repiping comes with a 28-year parts and labor guarantee. What do you guys charge? Understandably, price is relative to the service you need. To provide you with transparent, accurate, and fair pricing, we use a sophisticated construction estimating software to predetermine costs through RSMeans and Xactimate. This provides you with security and peace of mind knowing that our prices are not unique and arbitrary, but accurate and justifiable based on job requirements. Because we use this software for standardized pricing, we are usually one of the cheapest in town.